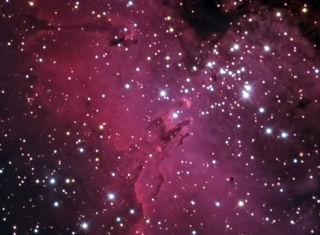 The Eagle Nebula is a cloud of interstellar gas and dust which surrounds an open star cluster of young, hot stars, at about 6500 light years away in constellation Serpens. The hydrogen gas ionized by the ultraviolet light from the surrounding hot stars glows red. 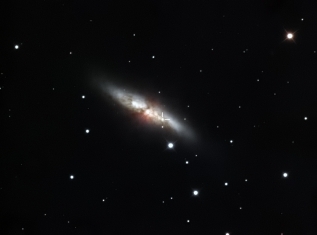 HST also took pictures of this area, commonly known as "The Pillars of Creation"
V-band photometric image of type II supernova in M106 Galaxy. 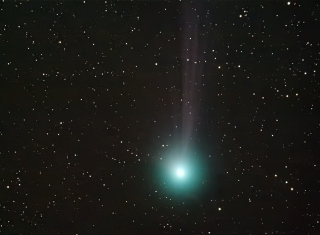 This SN was shining at 14.0 V magnitude according to the measurements on this image, taken on May 21st 2014, just a few hours after its discovery by PS1 Science Consortium. Notice the proximity to the galactic nucleus: only 3 arcseconds angular distance! Discovering the universe is a wonderful journey! Copyright © 2014-2019 Radu Gherase. All rights Reserved.